It has been three months since Mitchell and Tegan started their Forest Craftsperson Apprenticeship with the Forestry Commission. As part of the Land of the Fanns Scheme, the Forestry Commission at Thames Chase are hosting two apprentices on their National Apprenticeship Scheme. We have been with the Forestry Commission for three months now which has gone by so quickly. Within that time we have been involved in various habitat management works across the beat of the Thames Chase forests, working alongside our Forestry Commission colleagues, as well as the Thames Chase Trust Conservation volunteers. This has given us a nice introduction to the surrounding area, the local community of people who work and visit the forests, and a great knowledge about the various habitats and their management. Across the two years, we will have a wide variety of training at Thames Chase and around the country at other Forestry Commission sites, to not only ensure we can perform our roles safely, but to also acquire knowledge of effective habitat management and restoration. This knowledge, put into practice over time, will give us the necessary skills and experience towards the creation and maintenance of healthy woodlands for wildlife to flourish as well as places for people to enjoy recreationally. These two elements are the main focus of our apprenticeship programme. Since starting in November, we had our week long induction in the stunning surrounds of Cannock Chase forest in Staffordshire, where we had a chance to meet the other apprentices on the program. The week focused on learning about health and safety within the industry, and included emergency first aid training. This gave us all an insight into the world of forestry work and how to put into practice safe working, to ensure we always work with safety in mind for ourselves, work colleagues and the general public. 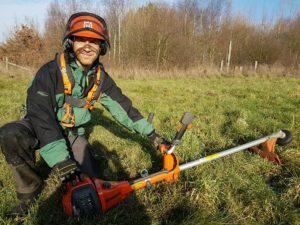 More recently, we had a four day training course at Thetford forest, on our first set of power tools, which are the strimmer, brush-cutter and clearance saw. After the four days, I am pleased to say that we all passed our assessment and gained our first qualification towards our Level 2 Apprenticeship, the first milestone in our training program. Now fully trained, we will be honing our skills in habitat management with our own tools. The first project we will be involved with is the restoration work along a section of the Ingrebourne river, in Pages Woods, working alongside the Thames Chase Trust Conservation Volunteers, to clear overgrown vegetation which will allow more light in to improve the water quality, but to also enhance the look and feel of the space for people to enjoy the river feature of this woodland.